While helmets are, no doubt, the key thing in motorcycling, you cannot underestimate the value of a well-made jacket. A quality jacket not only protects your upper body from impact in case of a crash but also serves as a strong fashion statement. Needless to say, quite a number of manufacturers have done their homework and provided the market with numerous jacket options to an extent that it might be tricky to arrive at an informed, final choice. 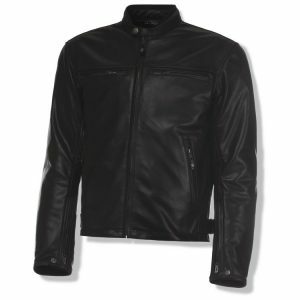 Confused about the best motorcycle jacket to pick for your cruising escapades? Here’s a quick primer on the top 6 choices that you can bank on – any day and any time. Built to provide a high level of protection and equally high degree of airflow, the Viking Cycle Warlock jacket is our top pick when it comes to the best bike jackets for protection. It comes equipped with CE-approved armor in both the elbows and shoulders to minimize injuries in case of a crash. In addition, the jacket is outfitted with chest pads to provide you with added protection. As if that’s not enough, it features a removable spine pad with pockets to allow for optional spine protector. Moving on, the arms, torso, and back are covered with a mesh shell to keep you cool throughout. On top of that, there is reflective piping at both front and rear to help you stay visible to other drivers at night. 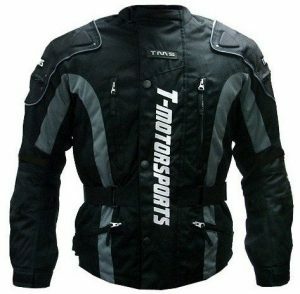 Additionally, the jacket boasts a multi-point SureFit adjustment system to ensure a customized fit. You can adjust the waist as well as the cuffs for a comfortable fit. You also can’t fail to notice the many interior pockets that this jacket comes with. So, yes, you’ll not need to struggle to find a pocket for your knife, earphones, pen, phone, keys, sunglasses, wallet, travel documents, and other belongings. 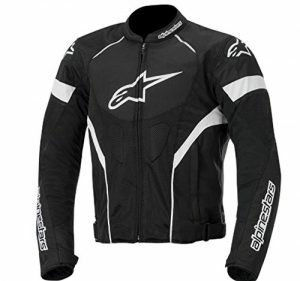 This is a great looking jacket for both off-road and street bikers. It features a waterproof full sleeve liner to keep you dry as long as possible during the rainy season. Additionally, the arms, torso, and back are fitted with cooling FreeAir mesh shell that allows for superior breathability. As such, you will be able to stay cool even during the hottest of weather conditions. Similarly, it is equipped with a zip-out insulated vest liner to keep you warm during the cold season. What’s more? The jacket includes INNOLITE ultra-reflective shoulders as well as 360 degrees reflective logos and stripes to keep you visible to other motorists, especially at night time. Further, it is outfitted with CE-approved armor in both the elbows and shoulders to protect your body from any impact. 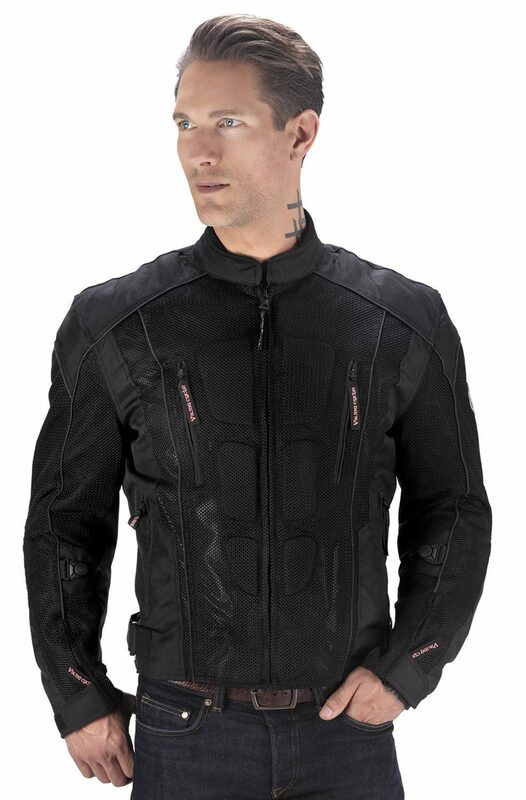 Like the Viking Cycle Warlock Mesh Jacket, it also boasts a removable spine pad with a pocket to allow for an optional spine protector. Additional features include two hand pockets, two belt loops, clip for the keys, eyeglass pocket, padded storage pocket at the lower back and a smartphone pocket. The TMS Enduro is a highly functional and versatile jacket with excellent protection. It is perfect for both on and off-road riding. Made of high-density nylon material, it is not only waterproof and windproof but can also adapt to all weather conditions. Besides, the jacket is equipped with zipped air vents that provide optimal ventilation and heat regulation during hot days. On top of that, it comes with a removable zip-out lining for comfort and breathability. For your protection, the TMS Enduro jacket has pockets on the shoulders and elbows for inserting soft armor pads that it comes with. However, you can add extra armor pads if you feel the ones included are not enough. Further, it sports a reflective strip to ensure you are visible to other motorists at night time for maximum safety. Thanks to its adjustable Velcro straps on the waist, neck, cuff area and upper arm, you can easily achieve a highly customized fit with this jacket. Also included with the jacket are adjustable waist belts and a soft-lined collar to give you superior comfort. Featuring full mesh lining all around, the jacket is well ventilated to ensure optimal airflow and breathability in warmer weather conditions. Also, it includes a long-sleeve windproof liner that serves as a windbreaker but can be removed if not needed. Additionally, the jacket’s back is packed with strategically positioned poly-fabric panels designed to ensure excellent maneuverability and flex fit without compromising safety. What’s more? It boasts 450-denier poly-fabric construction that is further reinforced with durable PU coating for increased durability and abrasion resistance. The shoulders and elbows feature lightweight CE protector to give you top of the line protection from impact. On top of that, the shoulders incorporate dual-density polymer sliders for extra abrasion resistance in the key impact areas. As if that’s not enough, its back and chest employ PE foam padding although you can add CE armor protectors. When it comes to comfort, the jacket boasts sport fit construction with a pre-curved sleeve to minimize fatigue and enhance riding comfort. The wrist cuffs and the waist also come with hook-and-loop closures to provide you with a secure and customized fit. 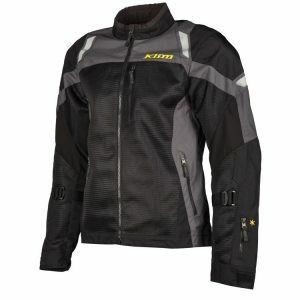 Made of Klim Karbonite nylon mesh materials along with Klim Rhino-stitch technology, the jacket is designed with durability and safety in mind. The materials are both heavy abrasion and tear resistant for superior protection against the pavement. What’s more? It boasts UV-resistant treatment on the mesh material to ensure it does not fade. In addition to this, the shoulders and elbows are reinforced with heavy-duty 840D textile for outstanding durability. Moving on, the jacket is fitted with D30 EVO C.E Level 1 armor at the back, elbows, and shoulders to provide you with loads of protection. To ensure you are visible to other motorists especially during the night, it features 3M Scotchlite reflective stripes on upper back as well as the upper and lower arms. Additionally, the Klim Induction jacket is supplied with tons of pockets including two zippered, one forearm emergency pocket for your ID and two chest pockets. For your comfort, it comes with a fleece-lined collar and cooling stretch mesh in the shoulder and elbow areas to keep you cool on hot days. On top of that, the jacket is equipped with an internal mesh liner for wicking moisture away. If you are looking for a functional and versatile yet fashionable jacket, this particular model from Olympia is an excellent choice. Its outer shell is constructed from 1.1-1.2mm top-grain leather with a Lux waxed finish to provide you with long-lasting performance. On top of that, it incorporates CE-approved flex armor at the shoulders, back, and elbows for the top of the line protection right-out-of-the-box. 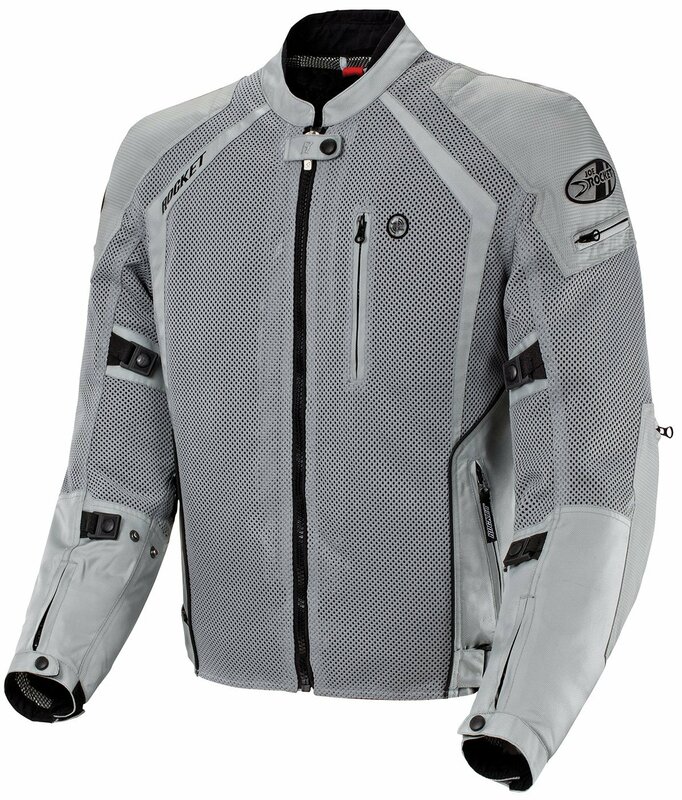 Additionally, the jacket is outfitted with cool mesh lining to ensure sufficient airflow and breathability. As if that’s not enough, the underarm employs perforated panels while the upper arm and lower backpack zippered vents for best air circulation in warmer weather conditions. Designed with a neoprene collar insert, the jacket also excels in terms of comfort. In addition, it features a full sleeve Insulex thermal layer to keep you warm during the colder climate. Best of all, the thermal layer comes with the zip-out option just in case you would like to remove it and two storage pockets. For storage, there are two Napoleon pockets on the inside and four external zipper pockets. While safety is the most important factor to consider when buying a motorcycle jacket, it is also important to buy a jacket that provides you with a great level of comfort and fits you perfectly. If you get the right jacket, you will not only feel safe but also confident on your ride regardless of your style of riding. So, have fun and be safe out there.